STOCKHOLM – Epiroc has added two new models to its Combi Cutter range. Designed for carriers in the 20 to 30 tonne and 25 to 40 Tonne operating weight classes respectively, the CC 2300 and CC 3100 offer a productive combination of short cycle times, easy handling and simple maintenance. 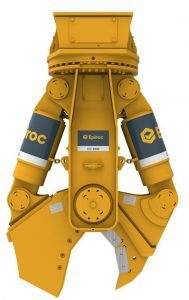 Expect short cycle times, easy handling and simple maintenance from Epiroc’s expanded Combi Cutter line. The CC 2300 and CC 3100 have all the well known features that make attachments in the Epiroc Combi Cutter range a popular choice for challenging tasks on demolition sites. They are robust, multi-purpose machines offering low noise, low vibration operation and suitable for practically any kind of primary demolition work. The cutting blades on all versions are replaceable and reversible and the attachments can be equipped with different sized jaws according to requirements. Like other attachments in the CC range, both the CC 2300 and the CC 3100 are available with two jaw versions, the universal version (U) and the steel cutting version (S). The universal versions are ideal for light to medium duty building demolition and heavy duty industrial demolition involving heavily reinforced concrete. The steel cutting versions are specifically designed for cutting steel profiles in general steel structures. Both versions are efficient tools for secondary reduction and material separation. The hydraulic drive gives 360° endless rotation, allowing precise handling and optimal positioning. If the cutter grips the material at an oblique angle a built-in pressure relief valve allows a “self-acting movement” that brings the cutter jaw into the ideal position. This valve effectively protects both the carrier and the cutter from potentially damaging reaction forces. A modular design and the fact that the jaws are mounted on one central bearing pin allow the cutter jaws to be changed easily on site. Thanks to the CAPS coupling and positioning system, the two jaws can quickly be removed and refitted as one unit. CAPS makes handling of the dismounted jaws much easier as the two jaws remain connected even after they have been removed from the body. Refitting is simple using the special guide system supplied.